I missed out on this thread growing! Denatured alcohol does not work well with thinning or cleaning like isopropyl. I've found out the hard way. Thanks for the heads up, MT. What's a good substitute for IPA? The only stuff my hardware store sells besides methylated spirits and industrial lacquer thinner is acetone (definitely too strong for my plastic airbrush) and kerosene. Thanks MechTech. Does Tamiya offer enamel spray? I only see polycarbonate and lacquer available from Tamiya. AFAIK, Tamiya only sells enamel paint in bottles. If you have an airbrush, you can thin down the enamel paint and spray it through the AB. 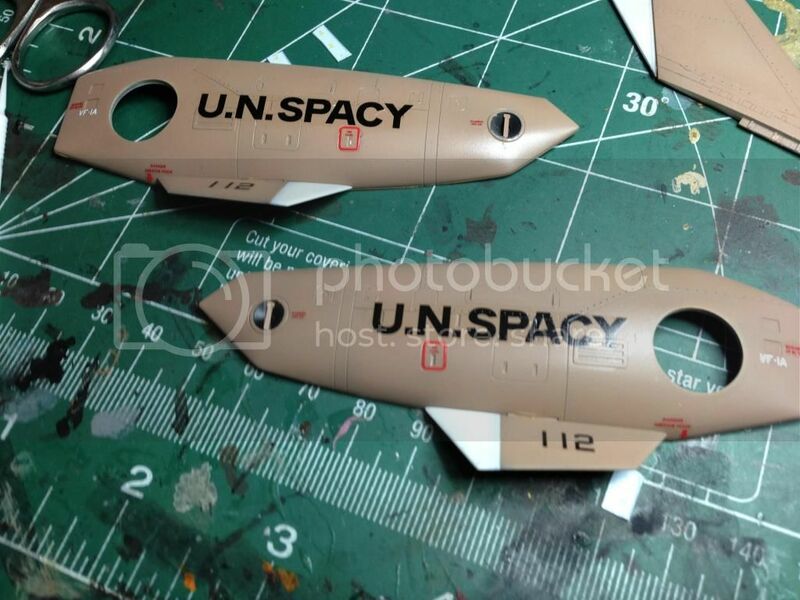 Easily, but your best bet is to remove the decal if you can, or respray the base color over it. Microscale offers several solutions (the blue or red one) in the little bottles that would help removing the decal. Several applications and you should be able to remove it, then reapply the white decal. Hot water works well too, you just need to be careful if you've got a gloss coat underneath. Actually, you'll probably be OK with the black one, as there's no real consensus on what color the CF has for the leg markings. My Google image searching showed up about 1/3 with white, 1/3 with black, and 1/3 with none. I myself am going with the black on my build. I based the black markings from the Wave CF. 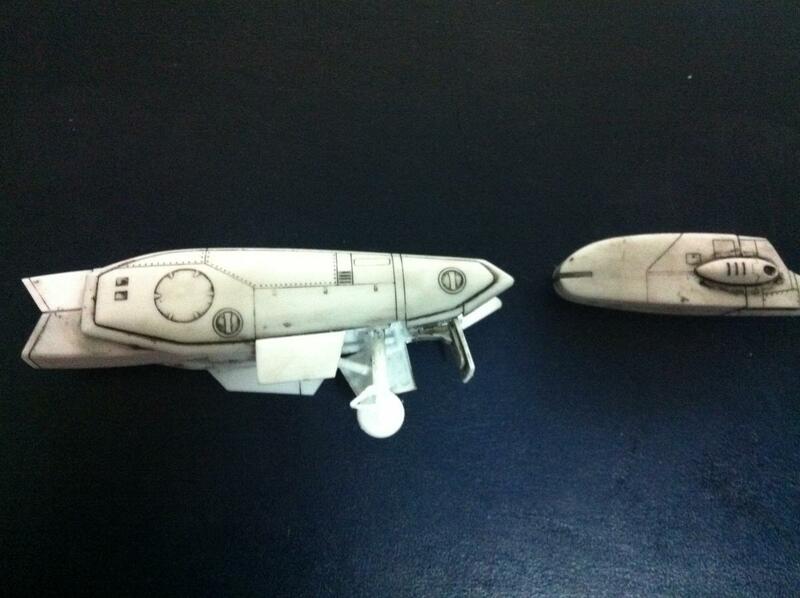 Then, i did a little more searching and saw that the Yamato toys had white ones. Whew! I panicked a bit there. Thanks, Jeff! Black looks better on that brown background. The black DOES look good! LOL! I wish you WOULD send me some booze; I need a drink after as all this searching for IPA substitutes. In this case, I guess I'll have to bite the bullet and keep using Tamiya's own brand of acrylic thinner to clean my airbrush. They last a long time when used for thinning paints, but I can just see the contents shrinking in the bottle when I use it to back-flush my AB. If my wallet had hands, it'd throttle me right now. it does look good in black! : ) thanks for the input, guys. Cleaning airbrush? I use laquer thinner that I bought from Home Depot. It's just for cleaning right? Strips away acrylic and a lacquer paint from your AB. I've been using it for years and so far have not encountered any problems. When I use it I have my gloves and respirator on. ALWAYS. I just did a bit of googling and some modelers advice using distilled white vinegar to clean Future and even acrylics paints from your airbrush. Just use Windex to clean or strip anything involving Tamiya acrylics. Trust me. works great. (but the longer you wait, the harder it is to clean or strip off) . oh...and DON'T let Future sit in your airbrush very long at all without cleaning it out...it will gum it up something fierce! From what I've read, you use future to dissolve itself. If it happens again, maybe adding a good amount will dissolve the dried up leftovers and after a while it can be cleaned out with rubbing alcohol. Just a theory. @derex: Thanks! No Windex in my neck of the woods, but I'm going to try a few other local brands of window cleaner and see which ones can be used. @EXO: That sounds like a great idea! Not something I'd experiment on my one and only airbrush, though, TBH. I'll try it out ony my old plastic AB if and when I get that HG AB later this year. Seriously, can't you ask your local drug store or hardware to stock rubbing alcohol? Without that or lacquer cleaner, you're basically in a real bind. Though I've been getting in the bad habit of forgetting to flush it out lately... I'm losing my mind. I did buy these things called interdental brushes to clean out my AB. Works like magic to get into the tight spaces and get the gunk out. They come with a bunch for about $5... it's like a lifetime supply. I could ask, but I doubt he'll do it. I once asked him if he could start stocking some primer, and he just said nobody buys them, and I'm the only one who's ever asked for them. His answer to my rubbing alcohol request will probably be the same. He does sell lacquer thinner, but I'll have to upgrade to a much stronger spray booth before being able to safely use it for thinning paint and cleaning my AB. Interdental brushes? Sounds like something I can certainly use for my AB. Some recommend piper-cleaners, but I heard they can damage the insides of the AB. I've been using paper towels and it takes a long time to get things done, almost as long as my spraying sessions. I'll definitely look around for these at the local pharmacies (aka drug stores). Don't buy lacquer thinner from a hobby shop. You should be able to get a huge container of the stuff for cheap at your local hardware or home goods store. Anywhere that sells paint should really have some. You can use the lacquer thinner in small containers to soak your AB parts to clean them and just spray a little cupful through your brush outside in the open air to give it a quick flush. You should be able to do that safely without a respirator if you are outside, but I certainly wouldn't use it to thin your paint and run a long (or even a short) painting session inside. The lacquer thinner should clean up just about anything you use in the airbrush with ease. Just don't let it sit for long on any plastic parts as it could attack the plastic. Thanks for the tips, Jardann! Never occurred to me to backflush the AB outdoors--one of the few times I'm actually glad I bought that battery-operated Tamiya compressor instead of the more heavy-duty but less portable ones. I heard that Tamiya acrylics can be made much more durable if you thinned them with lacquer thinner (Tamiya's own brand, at least) but I guess that would be too risky to do without a respirator. One more thing: The user manual for my airbrush says it can be used to spray enamel and lacquer paints. Does that mean the o-rings inside it are made of Teflon? Thanks for the heads-up, MT! I had a feeling it was too good to be true. Is there a tutorial on line art with hasegawa? I tried with black enemal + thinner mixture, let it dry then use thinner to clean up but its rubbing off and pretty much it doesn't stay on the line where I want them to be. Any tips? I know it's gundam but it's pretty similar technique. That's pretty much the same technique I used to use. Now, I use this, in black. Very easy to use, and you can apply it over properly set decals no problem. I've been using this for probably close to 2 years, and just finally finished my first bottle. Ah that was a nice tutorial, that wash is still the same as enamel paint + thinner and it will produce the same result? I've already bought the thinner and Tamiya black colour so I rather not waste it. The Promodelers Wash is actually a fine clay solution in water. That's why it's so easy to clean up.When using that particular wash, I do big decals down, then wash, then small decals (like the No Step, and stuff like that). For the enamel wash, do that first, then decal, because I'm almost certain that will eat away your decal if put on top of it. Thanks I just did a test run on a small piece of the model, I tried washing with water but it didn't come off so I tried with the thinner and it started to rub off! The result looks amazing but I still have a long way to go. Sometimes I think I rub too often and the lining disappears and it's kinda sad but the glue residue is visible. Ah it looks so good, need to find a tissue that doesn't break now lol. I don't use enamel... I'd be worried that it dries too quickly and you have a mess. My suggestion is to go to your local art store and buy a tube of black oil paint and maybe yellow or brown, as well as some mineral spirits. Its about 10 dollars total. Do the same procedure as in your link, except mix the black with a bit of brown or yellow. Rule of thumb is darker the area you're applying, the lighter your wash should be. However the difference is that you should just slather it over an area and wait like a day. Then take paper towel and wipe off the excess. If you've done it right, you should have a nicely defined thin line. I should also say that I usually do this over top of a gloss coat of future. If you've got any decals down, its probably best that you seal them with something like Gunze topcoat (From a rattle can), future, Model master gloss coat, or alclad aqua gloss. You can also use chalk pastels diluted with water and a drop of detergent to break the water's surface. Great for weathering and panel-washing. In my opinion, that's a pretty good start. But, I like to have my Macross kits dirty, not right from the factory clean. Ah okay, that picture is slightly more brighter than the actual colour . I think I'm just going to continue it. It would end up being smudgy like. Needed that reassurance before continuing, thanks! this is going to sound odd, and probably won't be helpful to anyone on here, but it might amuse some people at least. When I panel line, I throw on a pair of cheap, lint-free white cloth gloves and start lining away using Gundam lining and real touch markers. I work really messy with the markers and just wipe away the excess with the gloves as I go. it actually gives pretty clean results and requires no thinner and is pretty much mess free. Acrylic wash: I have had more success with this in the past. Use this over a non-acrylic surface. Mix black acrylic paint with water and a drop of liquid soap. The soap prevents the acrylic paint from sticking too much to the surface. BTW, prep the surface first with any clear coat aside from acrylic.